Andrea Cambridge and Chuck Varga wave goodbye to wedding guests after their Liberace-themed wedding at the Viva Las Vegas Wedding Chapel on Saturday, June 3, 2017. 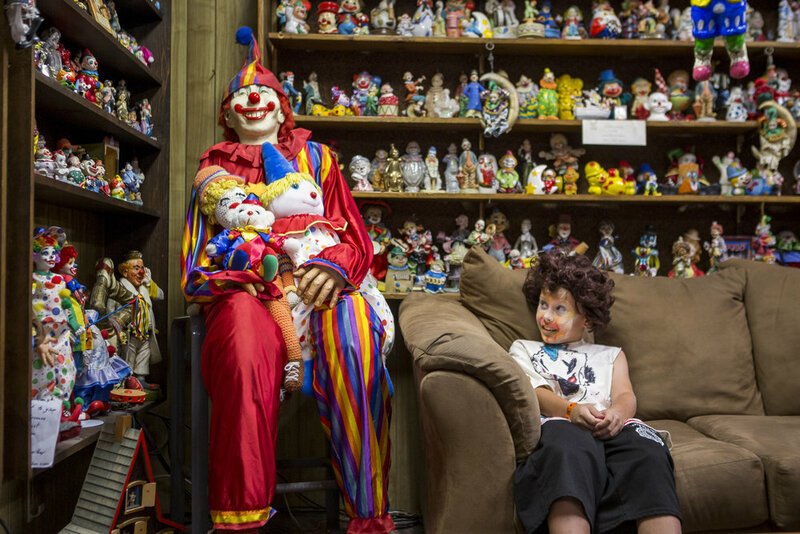 Kai James, 9, glances over at the life-size clown known as "Mr. Creepy" in the lobby of the Clown Motel in Tonopah, Nevada, on Tuesday, July 25, 2017. James came with his brother and mom from Las Vegas to stay for a night and dressed up in clown attire. Ramona Gantz, center left, comforts Debra Pleasant, center right, the grandmother of Roland Pleasant, during the sentencing for Eric Javon Bell, who pleaded guilty to killing 18-year-old Roland Pleasant, at the Regional Justice Center in Las Vegas on Monday, July 17, 2017. Kenny Stripling of Clarksville, Tennesee, performs a parody song about Donald Trump during his "Big Hands Don" tour in Washington, D.C., during the Women's March on Jan. 21, 2017. Stripling said he was a big fan of Trump just using his First Amendment right, but loved the marchers and said they're "what makes America great." Protesters throw a newsstand on a fire near the intersection of K and 14th streets in Washington, D.C., following the inauguration of Donald Trump on Jan. 20, 2017. Connor Lefevers yells in pain after being pepper sprayed while blocking the intersection of South High and State streets in Columbus following an anti-Trump rally on Jan. 30, 2017. Police gave demonstrators multiple warnings and waited for about 40 minutes before spraying protesters. Ronald Riley II, 6, runs with 10-week-old Peppa Pig as firefighters work on putting out a fire at Carriage Hill Apartments in Athens, Ohio, on Sunday, Feb. 26. The fire started just after 4 p.m.
Frayja, 7, and Fergus Hawson, 10, enjoy time playing with sand in Dunbar, Scotland, as rain clouds move in on July 23, 2015. They joined their parents Tom and Jenny, and their dog Beattie, on a sailing vacation along the Scotland coast. Autumn Zundel of New Alexandria, 9, rides Drifter at the Westmoreland Fairgrounds on Monday, July 18, 2016. The Harrold Alwine 4-H Horse Club met for a fun day of instruction and games for the members and their families. 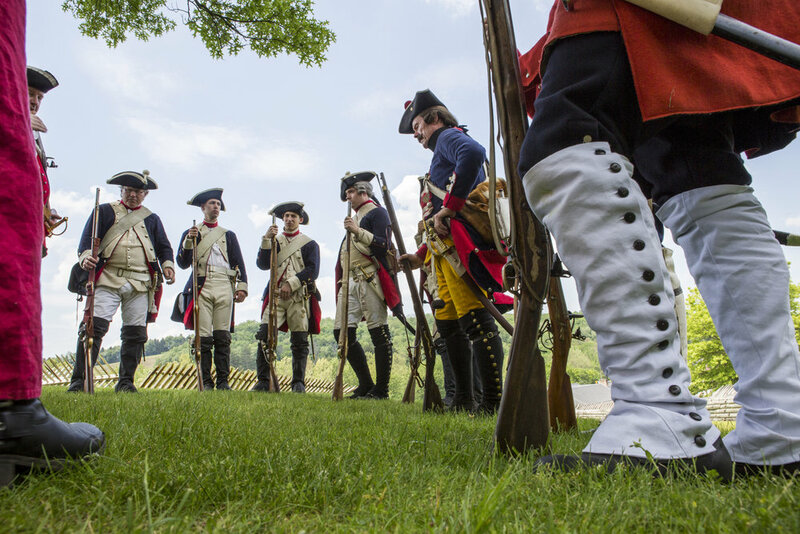 Reenactors of the 60th Royal American Regiment await the start of a battle reenactment with French forces at Fort Ligonier during Military History Weekend on Saturday, May 28, 2016 in Ligonier, Pennsylvania. Aleke Rickert enjoys GWAR's performance at Vans Warped Tour at the Hard Rock Hotel and Casino in Las Vegas on Friday, June 23, 2017. 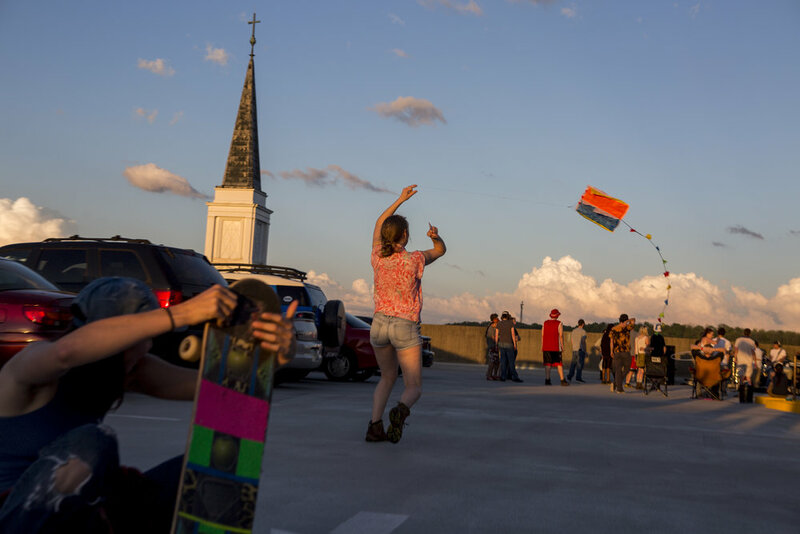 A woman twirls her kite as the sun sets during a rooftop concert in Athens, Ohio, on April 27, 2017. Teenagers play basketball on an unseasonably warm December day in Jeannette, Pennsylvania. HELP of Southern Nevada employees Louis Lacey and Hayli Petcoff check on a homeless man in a flood tunnel near the Hard Rock Hotel and Casino on Tuesday, June 27, 2017. After two homeless people died in early monsoon rains the previous year, Lacey and his team make it a priority to warn tunnel residents about potential rain. Mason Markosky pets Sleepy the horse after riding while being held by his mother Catherine, owner of Southern Tier Alternative Therapies (STAT), at the Ligonier Theraputic Center in Cook Township, Pennsylvania, on Monday, July 18, 2016. Mason has a rare condition called Costello Syndrome and couldn't sit up or walk until he tried hippotherapy. Nic Boyes works on his laptop in his houseboat along the Union Canal in Edinburgh, Scotland on August 1, 2015. Boyes has lived in a houseboat for several years and said he likes the freedom it affords him in moving around. 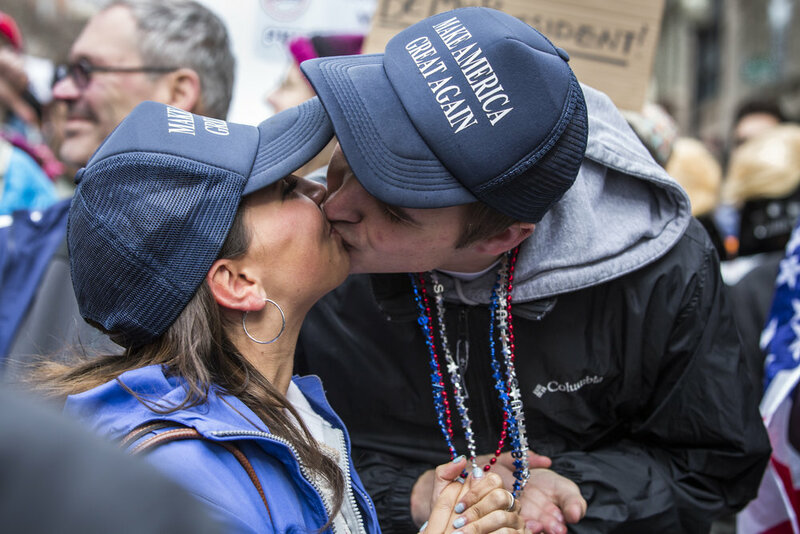 Austin Phillips and Kristy Lowenkron of Baltimore celebrate following the swearing in of President Donald Trump in Washington, D.C., on Inauguration Day 2017. Noah Weber, 9, of Athens, Ohio, judges how good he looks in bird wings with his dad's, Jason Weber's, help in Central Venue in Athens, Ohio, on Oct. 20, 2014. Noah and his dad have helped in making costumes in years past and marched in the Halloween parade the following Saturday. Root 66 Plants co-owner Eric Sarn (left), rearranges flowers with the help of his friend Kery Kim after the cold temperatures overnight forced Sarn to move his plants inside on May 16, 2016 along Business Route 66 in Greensburg, Pennsylvania. Sarn and co-owner Rob Wallace have been selling plants each spring for the past nine years. Robert Repovz, 6, splashes through rain water running across First Street while his mother Anita and baby sister Gabriella watch in New Stanton, Pennsylvania, on Saturday, July 30, 2016. John Schivik of the Mon Valley Harley Owners Group greets a puppy after a long ride from Tennessee at the Rostraver Airport on Saturday, July 30, 2016. The dogs were being taken back to Hot Metal Harley-Davidson for a fundraiser and were being put up for adoption immediately. Luanne O’Brien, owner and instructor at Integral Ballroom in Murrysville, Pennsylvania, teaches a class of four couples on Thursday, Dec. 22, 2016. Rita Firestone of Greensburg and her assistant of four years, Jacob Porch, sell corn to customers along Route 30 in Latrobe, Pennsylvania, on Friday, July 1, 2016. Firestone has been selling corn, flowers, pumpkins and the like at the same spot for 46 years. A College of Southern Nevada graduate talks with an audience member on the phone before the start of commencement at the Thomas and Mack Center in Las Vegas on Monday, May 15, 2017. 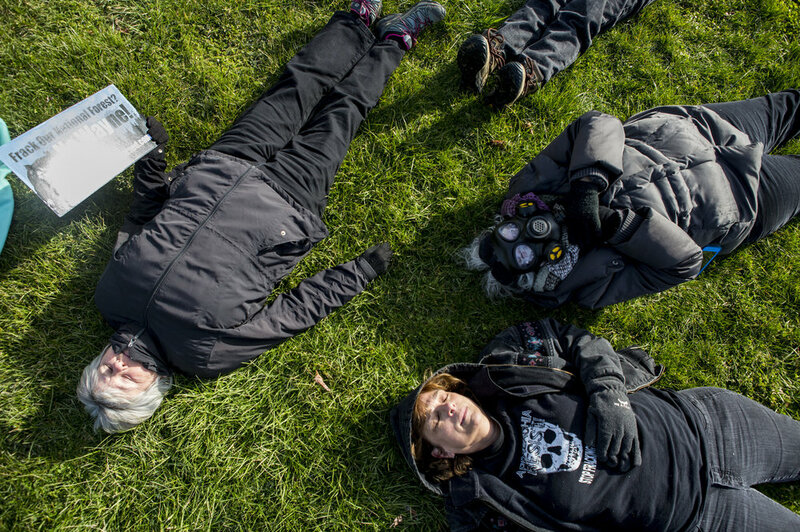 Protesters lay outside of the Wayne National Forest Headquarters during a "die-in" to demonstrate against the auction of Wayne land for fracking along Route 33 in Athens County, Ohio, on March 23, 2017. Brooklynn Winslow, 8, shows off her sparkly American flag dress and torch while her mother Natalie Winslow smiles during the Summerlin Council Patriotic Parade in Summerlin, outside of Las Vegas, on Tuesday, July 4, 2017. Dr. Len Kreisler, 87, balances a tennis ball on his racket at the Mountain Shadows Community Center in Summerlin on Monday, July 31, 2017. Despite his age, Kreisler still rides his bike to the center multiple times a week.